Paletseal - Sigillo di sicurezza per applicazioni speciali, realizzato in plastica, è utilizzato per garantire le cartelle volantino delle merci, definito dal pallet e la garanzia di vari trasporti merci. The Paletseal plastic security seal is also named Pallet Seal. Plastic security seals for special applications (Осигурителни пломби за сигурност, Sigurnosne brtve posebne aplikacije, Σφραγιδες ασφαλειας δεη ειδικές εφαρμογές, Biztonsági plomba, Sigilli di garanzia plastica, Sicherheitsplomben für Spezialanwendungen), made by plastic, are used in ensuring handout folders of documents, defined by the pallet and assurance of various goods transport in areas such as pharma, auto parts, or courier/postal activities. This types of special applications security seals like Paletseal can be used on a wide variety of applications upon your needs and requirements and tend to be more tamper resistant than variable length as there are no sliding parts, they simply ‘click’ into place to lock, which can make them easier to fit than variable length seals. Most special applications security seals can also be branded and numbered for extra security. It is often the choice of single use security seals for transport applications. 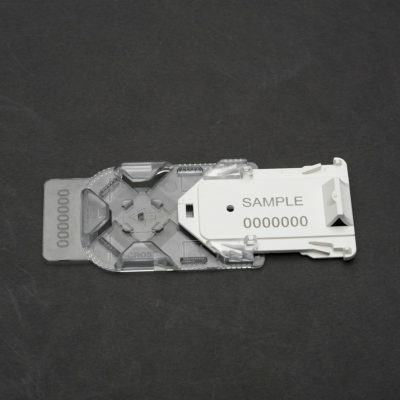 Advantages: the possibility of visual control of integrity; easy to install; high quality; can not be opened without damage; unique numbering, barcode and logo; favorable price. Disadvantages: security seal’s material is easily broken and can not serve as a fastening element.